Planning to check out Taipei on your upcoming trip to Asia? You won’t regret it! Taipei’s one of the best cities to visit in Asia. I know many would disagree with me, but I’ll defend Taiwan‘s capital as long as there’s still enough blood rushing through my fingers to hammer out keys on this MacBook. I’m assuming if you’ve found this article, you’ve already got an idea of where to stay in Taipei. Although it’s a big (many massive is the better word) city, Taipei isn’t so hard to navigate. Most sites in Taipei are packed within a short walk or quick MRT ride from one another. Why stay near Taipei Main Station? Taipei Main Station sits at the northern edge of Zhongzheng District, the commercial heart of Taipei City. Besides sheltering some of Taipei’s most popular attractions—Chiang Kai Shek Memorial Hall, eastern Ximending, 2/28 Peace Park, etc.—Zhongzheng District is well-connected to the rest of the city through none other than Taipei Main Station. For getting around Taipei, two MRT lines run through here, the most popular of which for travellers is the Red Line (Tamsui-Xinyi), linking Zhongzheng to Taipei 101, Shilin Night Market and Tamsui. As the city’s main transport hub, Taipei Main Station (and the nearby bus station) also connects you to the rest of Taiwan. Launching day trips from Taipei usually starts here. Staying close by allows you to rock out some easy early morning journeys to get a one-up on the crazy tourist crowds that descend with fury unto the top destinations of Northern Taiwan. Interested in other areas near Taipei Main Station? 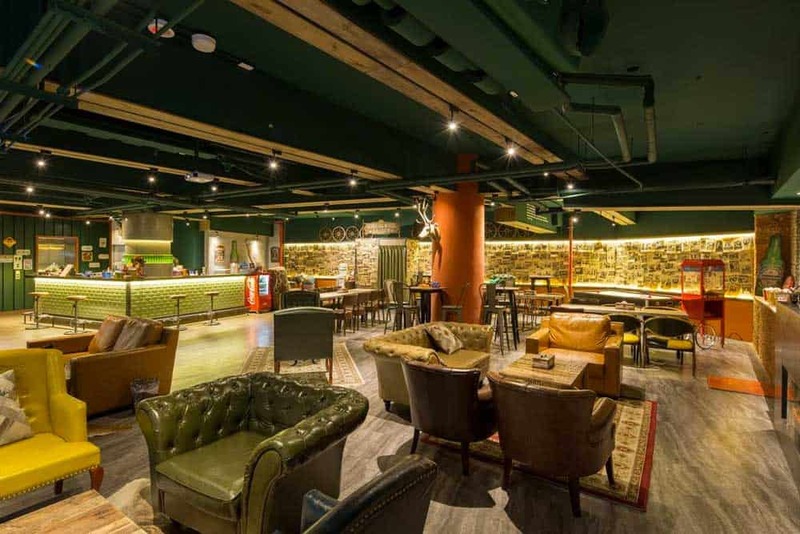 Check out this complete guide to the best hotels in Ximending, a nearby area that’s one of Taipei’s coolest for travellers! The area around Taipei Main Station is one of the best places in Taipei for budget accommodations. There are far too many good cheap places to stay to list all of them here, so I’ve narrowed it down to just a handful. Not only its it conveniently located near Taipei Main Station, but Taipei Sunny Hostel is simply one of the best budget budget hotels in Taipei. The “hostel” appended to the end of the name does little to describe what’s offered at this modern guesthouse. Don’t expect to find a typical loud backpacker hangout, chocked with twenty-something crammed in 12-bed dorms. 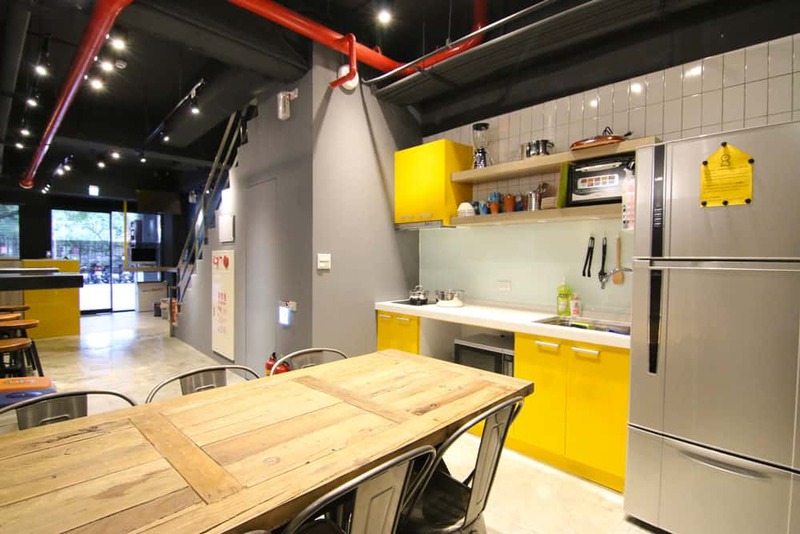 Taipei Sunny Hostel dishes out clean, private rooms with private bathrooms well suited for solo travellers, couples and even families up to 6 people. The beautiful minimalist design of the common areas showcases European and industrial inspirations, giving the guesthouse a unique vibe. Although there are other hotels closer to the main station, the less than 10-minute walk still puts the entire city at your fingertips. The location next to beautiful 2/28 Peace Park should win Taipei Sunny Hostel some extra points. There’s little chance you’ll find better hostel closer to Taipei Main Station than NiHao Taipei Hostel. These stylish backpacker digs sit within a one-minute walk of the M3 exit of the station. Arriving in Taipei for the first time, you’ll love the ease of checking into your accommodations quickly and getting started exploring right away. 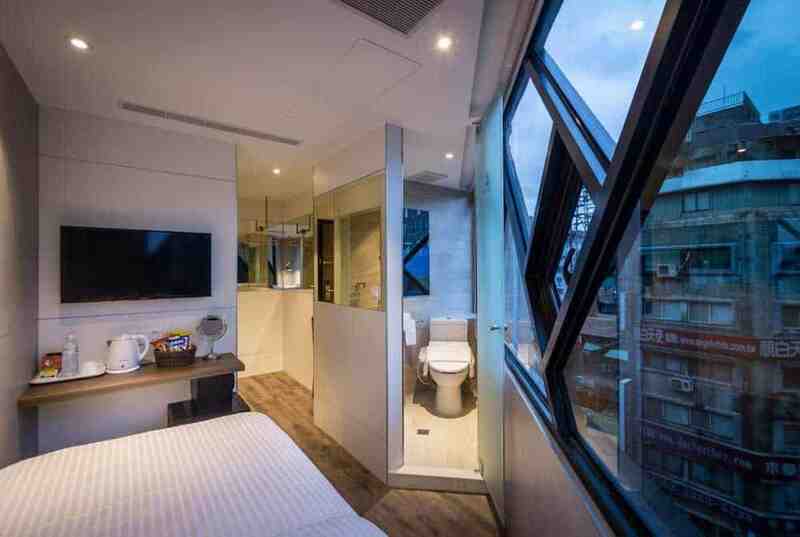 There’s a room for every type of budget traveller at NiHao Taipei Hostel from dorms to private rooms with shared bathrooms and family rooms to doubles with private bathrooms. Even in the most budget-friendly dorms, NiHao Taipei Hostel offers nice touches like personal reading lights and lockers to store your valuables. If you’ve ever fancied a night on the Starship Enterprise on a budget, Space Inn Hengyang Branch could just be what Dr. Spock ordered. This otherworldly hostel prides itself on its unique design touches pulled directly from the world of science fiction. With its dorm rooms and shared facilities Space Inn is most suitable for backpackers travelling solo or in platonic tandem. Besides the clean modern rooms, the funky common area with its games room is a space-age place to chill out after a hard day of sightseeing. Space Inn is not the closest hostel to Taipei Main Station, but the quick 10-minute walk is hardly a burden either. The nearby 2/28 Peace Park is close by for a relaxing escape from a city that’s always buzzing. Even without its location close to Taipei Main Station, you’ll find a lot to like about InPage Hotel & Hostel. This modern hostel features both dorms and private rooms with shared bathrooms, perfect for backpackers looking to save without compromising cleanliness or centrality. 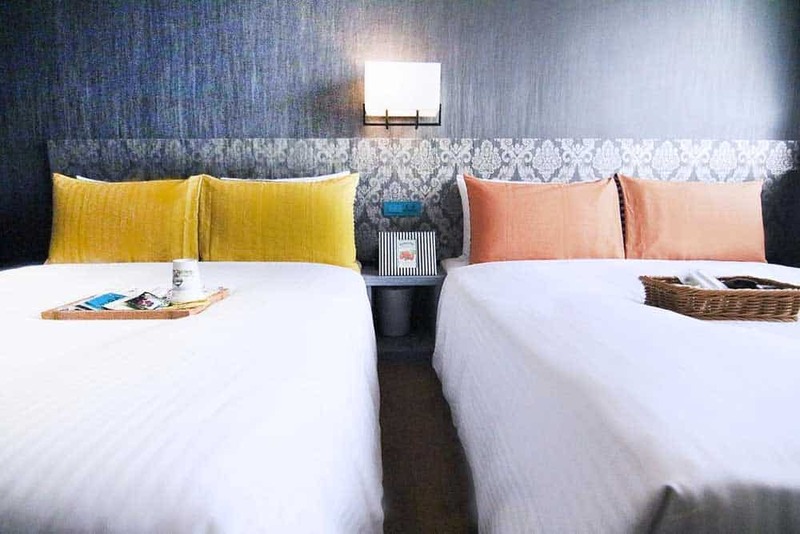 With the bus station and train station at its doorstep, just a six-minute walk away, zipping around the city to experience the breadth of Taipei for InPage Hotel & Hostel is a cinch. 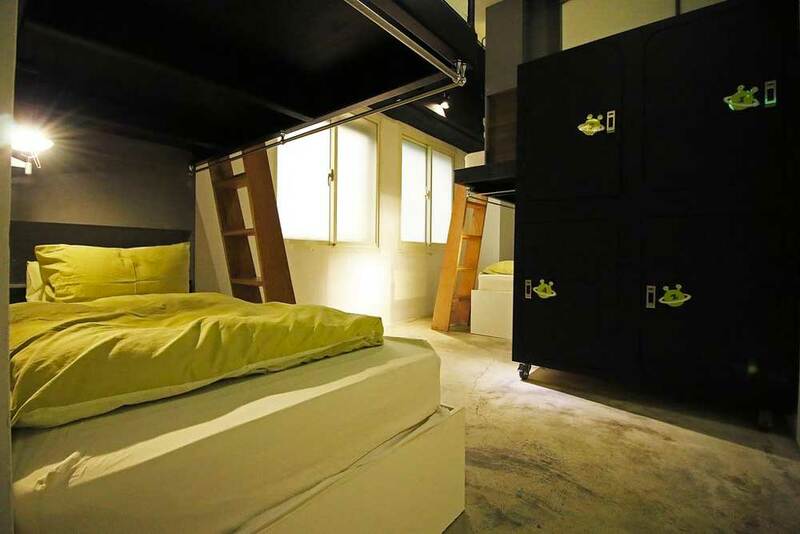 While there’s no shortage of hostels around Taipei Main Station, Flip Flop Hostel – Main Station is one of the best. As the funky colourful building greets you in a city not exactly known for flamboyance, you know you’re in for a good time. 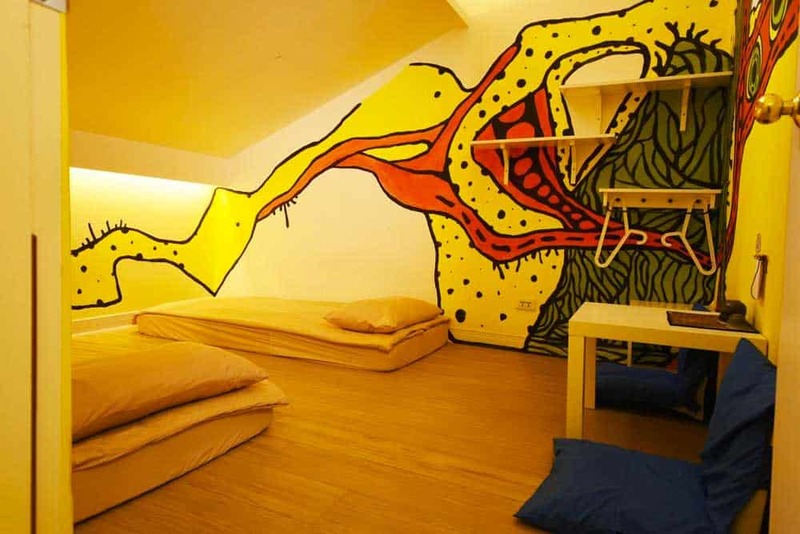 Young backpackers will particularly dig the vibe of this happenin’ hostel. The congenial common area is a superb place to meet new friends while you get to know Taipei a little better. Mixed and female-only dorms are offered along with twin rooms, all sharing the common bathroom facilities. Just a five-minute walk gets you to Taipei Main Station to explore the city in depth. 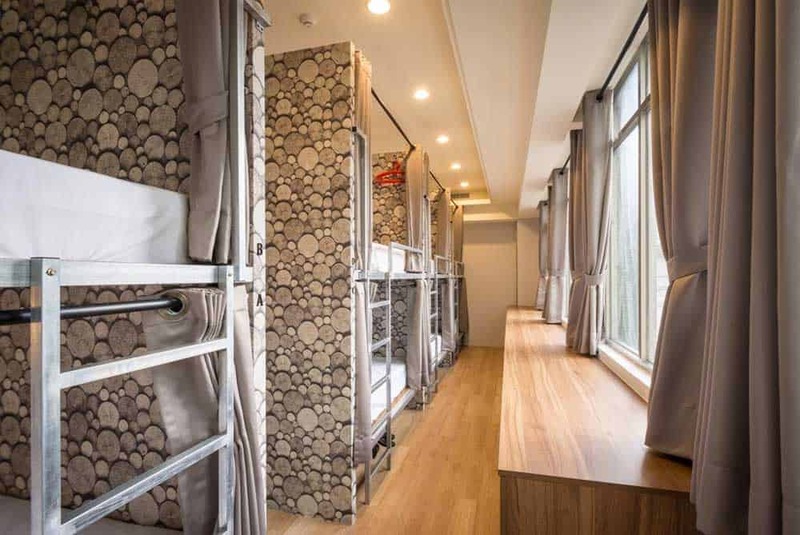 The name might leave memories of Tokyo in its wake, but what you’ll find at Taiwan Youth Hostel & Capsule Hotel probably isn’t quite what you’d expect. 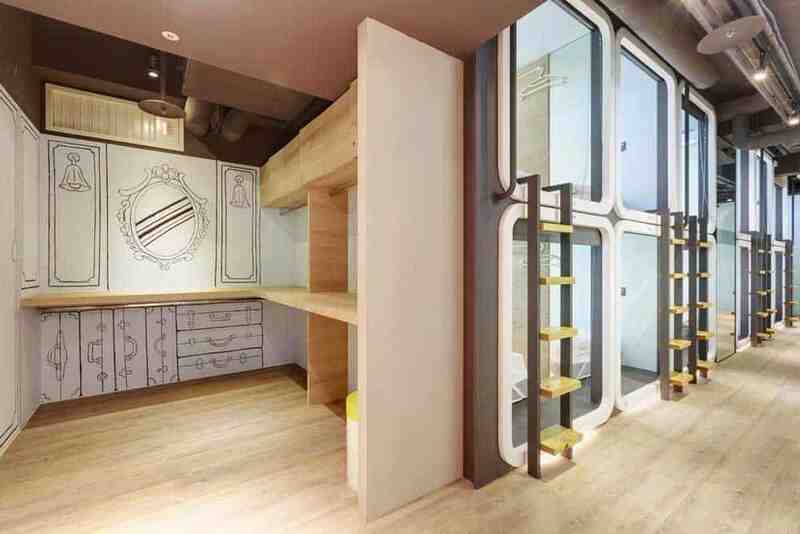 The digs are less capsules than luxury dorm beds, replete with personal reading lights and even flat-screen TVs. Not your usual hostel, to say the least. All the facilities are clean and modern from the share kitchen to the bathrooms and the homey common area. And at just 150 metres from the main station, Taipei Youth Hostel & Capsule Hotel is one of the most conveniently located budget picks of the bunch. 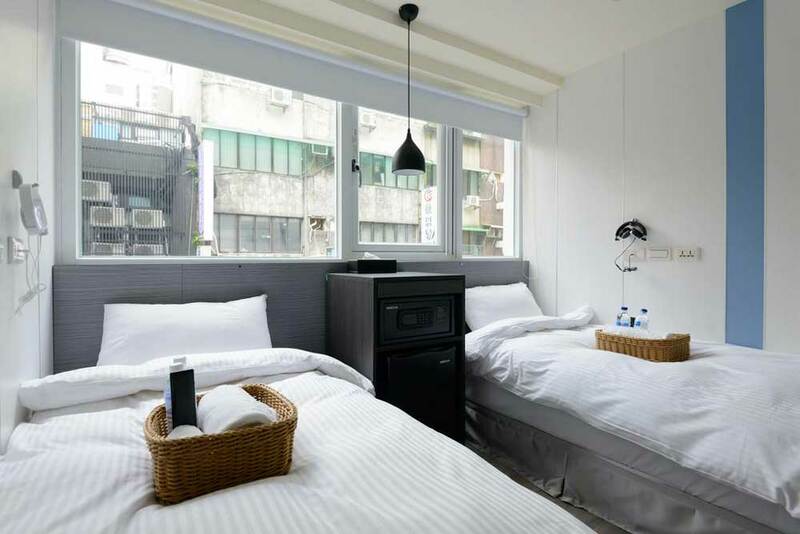 A quick 32-metre stumble outside of Taipei Main Station will land you on the doorstep of miniinn, one of the top backpacker joints in Taipei. While the dorms at this modern hostel are more no-frills than other (more expensive) budget choices in the area, the value is superb. Besides the central location, miniinn prides itself on comfort and cleanliness. The delicious free breakfast is a nice touch to fuel up for your day. The name says it all: Poshpacker Hotel caters more to a backpacking crowd than your usual business traveller. What results is a surprising mix that’s a little too snazzy to be a hostel and not quite a full on budget hotel. Rooms at the Poshpacker Hotel are surprisingly stylish and bright, not exactly a given in Taipei where rooms with big windows don’t always come standard. The small attached café supplies a nice morning dose of caffeine to kick start your sightseeing engine. Taipei Main Station is a short 8-minute walk away. If you’re looking to spend a little more, quite a few more options will open up around Taipei Main Station. All of these intermediate hotels offers private rooms with private bathrooms, the true differentiator between the first two budget categories. A splash of unique style sets Roaders Hotel ahead of the pack when deciding where to stay in Taipei. This isn’t just one of the best hotels near Taipei Main Station, but among the best in the city in this price range. The hotel’s design is road-trip-inspired, obvious when staring down the cool hall feature wall adorned with dozens of U.S. state licence plates. Rustic touches among the modern amenities in the guest rooms add a refreshing flair. If the American theme wasn’t obvious enough, plop yourself in the saloon to sip drinks among whiskey barrels and wagon-wheels. There’s even a play area for children and a fitness centre to sweat out all the oyster vermicelli and pepper buns. Like Taipei Main Station, the Ximending Shopping Area is a quick 10-minute-or-less walk from Roaders Hotel. It’s near impossible to not be delighted by the design of Finders Hotel. Trying to pin it down is tough, part of the reason that this charming 3-star hotel is so unique. Much of the hotel features an earthy palette enhanced by trees, hanging vegetation and an influx of deer decorations that seem to point to an unofficial mascot. The simple but elegant Via Hotel Taipei Station is one of the best values among hotels near Taipei Main Station. Clean and modern guest rooms are kissed with soft neutral tones that give them a comfy atmosphere. There’s even soundproofing to ensure that the busyness of Taipei doesn’t creep into your sleep. Besides sitting just ten minutes from Taipei Main Station and Ximending, Via Hotel Taipei Station doles out free snacks for guests in the common area, including ice cream that comes in handy in Taipei’s humid summer months. For a perk you won’t find in many mid-range hotels, relax in the hotel’s massaging chairs to push out some stress. 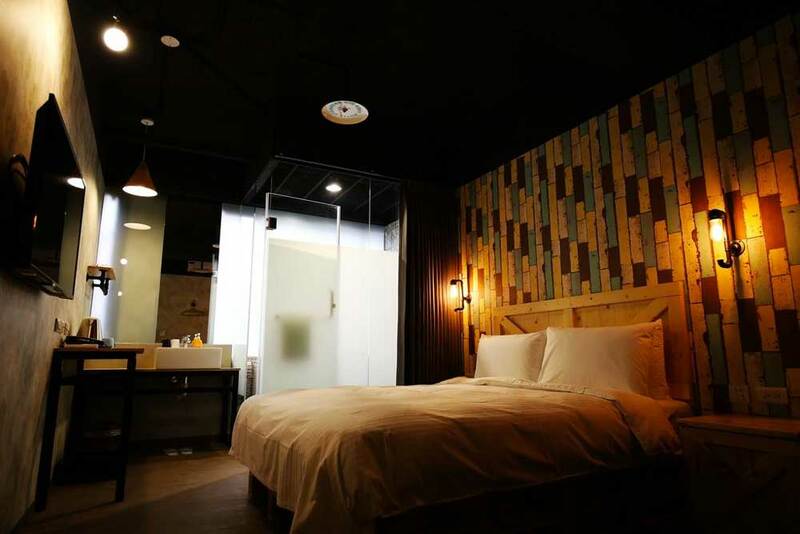 The retro stylings of the NYS Loft Hotel give it more than enough funk to slap it up on a list of the best hotels near Taipei Main Station. Any common area that resembles the lobby of 1960-70s recording studio, decorated with vinyl and vintage-style Beatles posters, gets the nod in my book. Even beyond the colourful lounge, the guest rooms hoard classic and rustic designs to create a wholly unique experience. Did I mention that Taipei Main Station is close? Within a minuscule 2-minute, 120-metre walk you’ll be out the train station door and checking-in at NYS Loft Hotel. Stay at Hotel Relax 5 (or any of the other Hotel Relax locations scattered around the area for that matter) and you’ll see just why the name is so fitting. 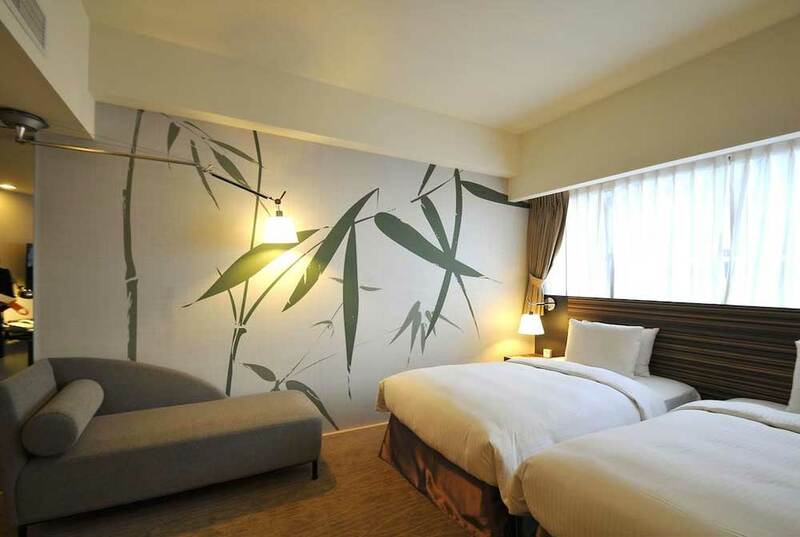 This 3-star hotel, located within a 5-minute walk of Taipei Main Station, features small but comfy rooms that are perfect for a short stay in Taipei. The real thumbs up for Hotel Relax 5 is the staff who will go the extra mile to make sure your trip to Taipei sets off without a hitch. As one of the closest hotels to Taipei Main Station (3 minutes walking distance), CityInn Hotel Taipei Station Branch I (or any of the other branches here) is bound to catch your eye. 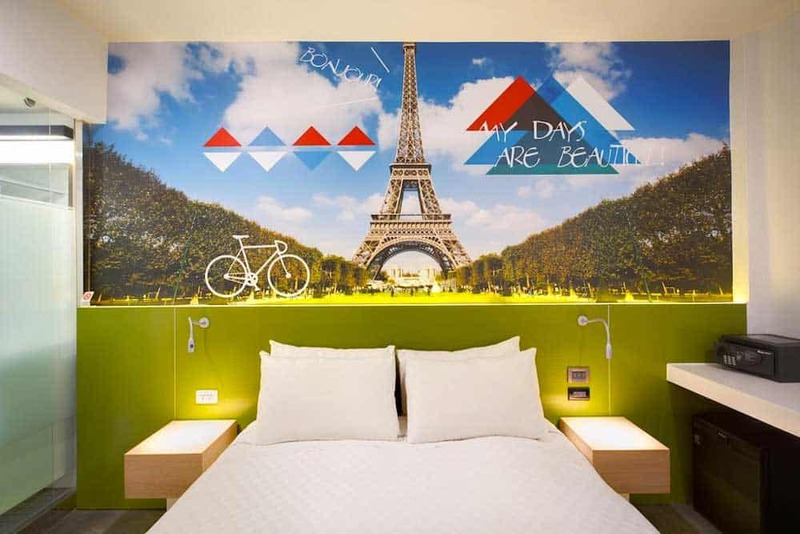 Shunning the typical cookie-cutter hotel rooms in other chains, this 3-star hotel features rooms with unique colorful and quirky murals that set each apart. For guests looking to self-cater, there’s a 24-hour kitchenette with a microwave and fridge. (Although with all of the lovely cheap food in Taipei, I’d advise against it!) There are even laundry facilities at CityInn to get prepped for next stage of your Taiwan itinerary. 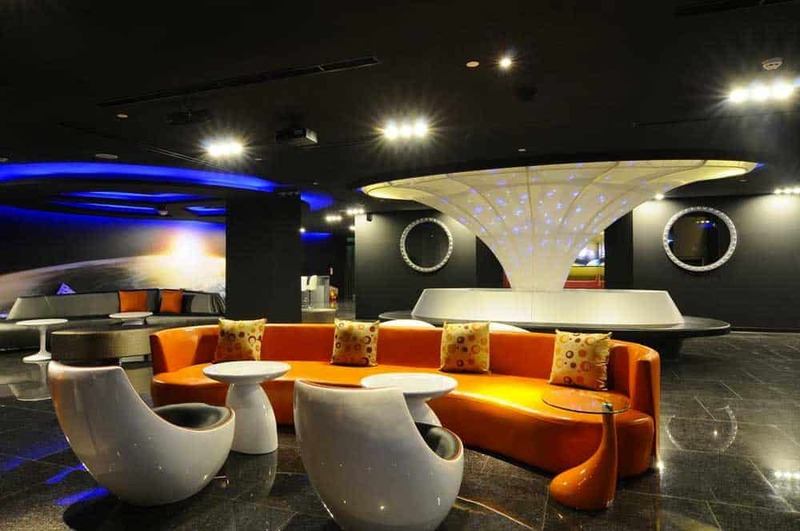 Walking in the front lobby Taipei M Hotel – Main Station radiates a sophisticated business vibe. Once you dig in further though, you’ll see just how great a place this is for travellers of every ilk. Besides the quick 6-minute walk to Taipei Main Station, the big selling point of Taipei M Hotel is the turf-lined sun terrace overlooking Taipei. Rooms throughout the hotel are cozy with the higher-end rooms squeezing in some extra space compared to others in the same price range. Start your day by chowing down at the breakfast buffet or end your evening with drinks at the hotel bar to round out your experience. 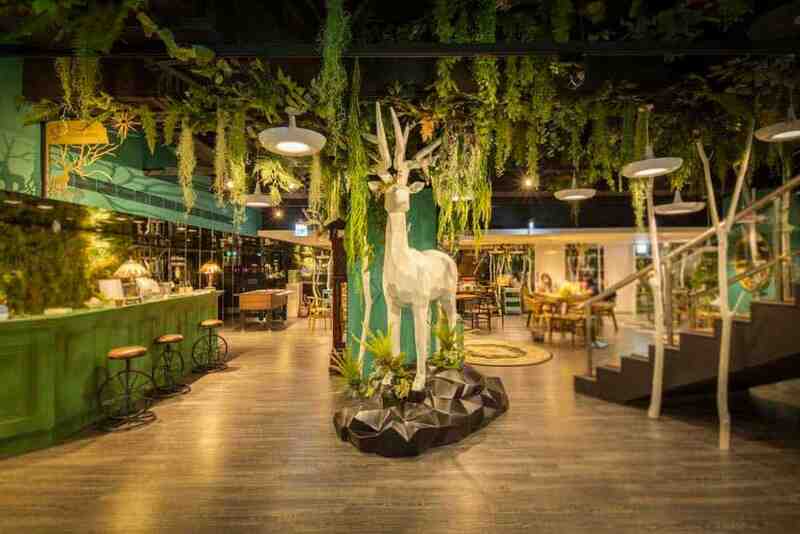 Among the handful of hotel offerings in this local chain, Diary of Taipei Hotel – Main Station is the best of the bunch. Even if some of the marble floors and decor seem stuck in the past, the rooms in this 3-star are clean and spacious by usual Taipei standards. 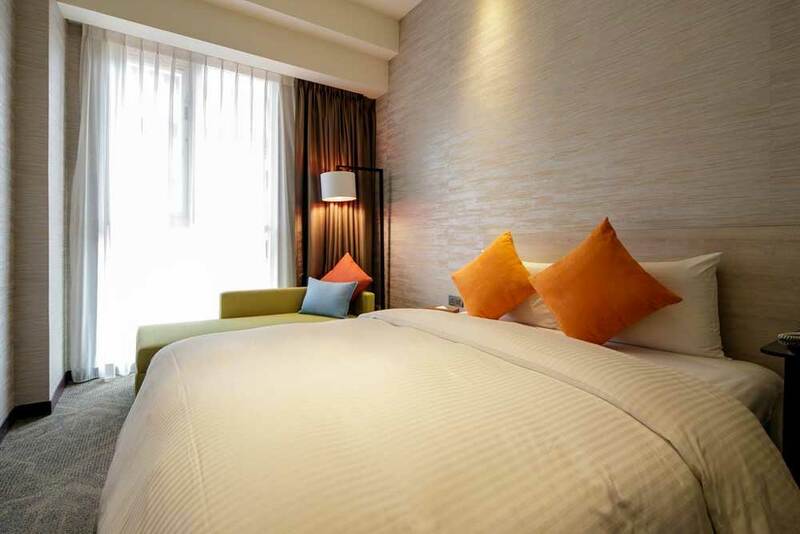 The true pull of Diary of Taipei Hotel – Main Station is the convenient location. Just 5 minutes of walking stands between you and Taipei Main Station to get around the city and beyond. Both Ximending and Ningxia Night Market, one of the best night markets in Taipei, are also within walking distance. There isn’t a big selection of 4- and 5-star properties in this part of town. Most of the best 5-star hotels in Taipei are clustered around Xinyi District and Zhongshan District where business travellers tend to congregate. Don’t be surprised if the following properties don’t quite have the glitz or swank you’d expect in a major Asian city. 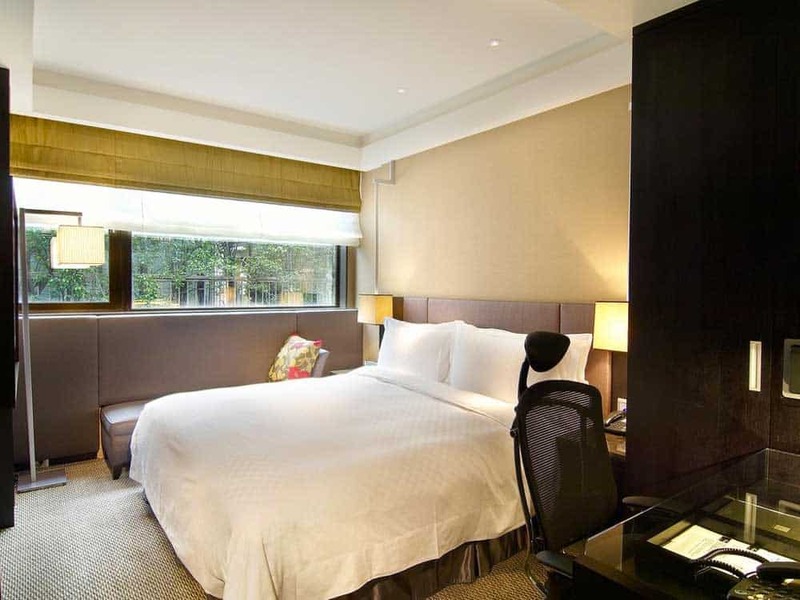 There’s no more sophisticated place to stay near Taipei Main Station than the Sheraton Grand Taipei Hotel. A fusion of classic Chinese and modern Western elements charms throughout this 5-star hotel in the heart of Taipei. 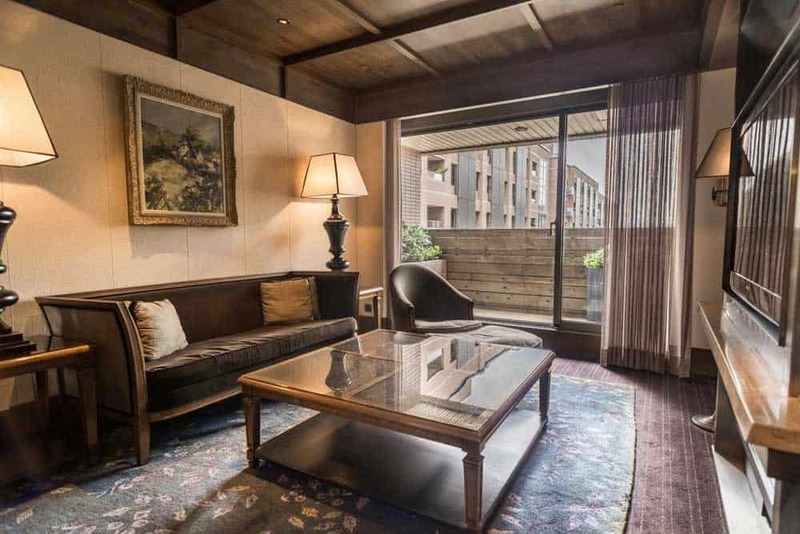 The rooms are what you’d expect from an older grand hotel in Taipei, stripped of much of the glitz of other luxury hotels in Taipei like those in Xinyi District, but still comfortable. As with most 5-star hotels, the true grace of the Sheraton Grand Taipei Hotel lies within the amenities. 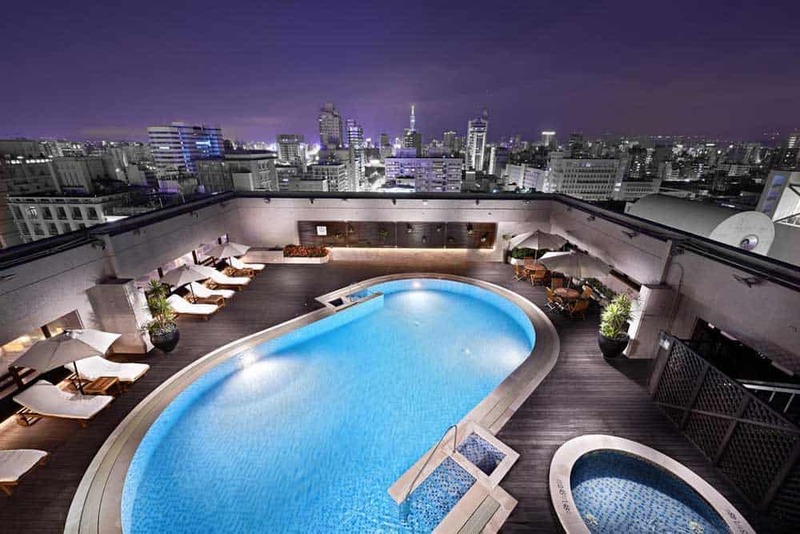 The beautiful outdoor pool and hot tub provide the perfect excuse to relax and enjoy the Taipei night sky. Over half a dozen on-site restaurants deliver a good case for eating in, especially forking back delectable Thai dishes at Sukhothai Thai or classic Chinese at The Guest House. Located directly across from Taipei Main Station, Caesar Park Hotel Taipei is one of the most convenient picks for travellers who live by the mantra “Location! Location! Location!” The one-minute walk is the main reason that drives most to stay here. Just beware: There’s a bit of inconsistency at Caesar Park Hotel. Newly-renovated rooms feature bright dashes of colour and modern furnishings, while the older of the bunch appear a little tired. If you can, insist on a newer room to get the most out of your stay. 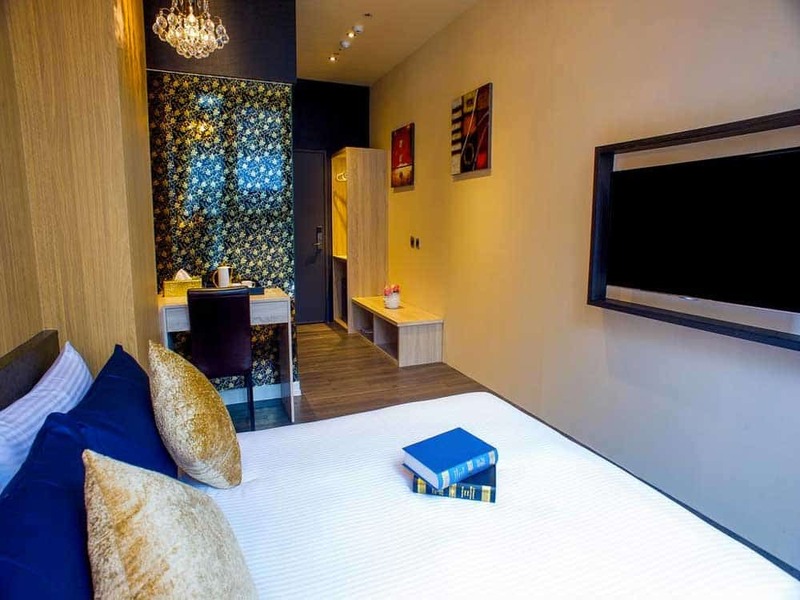 You’ve probably noticed that it’s slim pickings for luxury hotels around Taipei Main Station. The Tango Hotel Taipei Nanshi is a bit further out, but makes a good case for anyone looking for an uptick in comfort within a 10-minute walk of the station. Rooms at The Tango Hotel Taipei Nanshi are a good size for Taipei, an ordinarily tightly-packed city. Each is fitted with a spa bathtub for relaxation. (There’s even a TV in the bathroom to practice your Chinese listening skills with some primetime drama!) Perhaps best of all is the location just up the street from Ningxia Night Market and a quick direct ride via the adjacent Zhongshan MRT Station to Shilin Night Market, Taipei’s biggest. The elegance of PALAIS de Chine Hotel is unsurpassed in the area around Taipei Main Station. Combining classic European style with Chinese flair, this hotel oozes charm in every inch whether in the exquisite guest rooms or the palatial lobby. Even with Ningxia Night Market and Ximending a short walk away, PALAIS de Chine Hotel beckons patrons to skip the street food and eat at one of the four on-site restaurants & bars. Whether it’s tasting a slice of Hong Kong at Le Palais or of Paris at La Rotisserie, the food options at PALAIS de Chine are bound to shake your taste buds. There’s only a handful of 4-star hotels near the main station, and Cosmos Hotel Taipei might be the best among them. The room decor aims for regality and elegance rather than mirroring the clean modern lines of most contemporary hotel rooms, bestowing a certain uniqueness upon the hotel when compared to its counterparts. A location just one minute from the M3 exit of Taipei Main Station means there’ll be no fussing after arriving in Taipei—just check in, and start hitting the town. Even with many of the city’s night markets screaming for your attention with just a short walk or MRT ride, the on-site Jade Restaurant serves up delicious Cantonese favourites including dim sum.